PA system is great for making your speech audible or essential to have a great music experience. If you are a performing musician, you need the best PA system to capture, mix, and amplify your sounds. There are many factors you have to consider when choosing a good PA system. It should accurately match your type of music, provide a high-quality output, be suitable for the venue where you play, and match your budget too. It is also important to consider the size of your regular audience and portability of the entire set. Most importantly, the system should deliver perfect clarity and definition. A public address system, also called a sound reinforcement system, provides sound amplification from the performer to his or her audience. It is a set of several components, each with its own function. With so many parts and pieces to consider in a PA system, it can be difficult to know exactly what to look for when shopping for the best set of PA equipment. Fortunately, we have researched and reviewed the majority PA systems on the market today to make the choice easier for you. Go through our short list of top PA systems reviewed below and find one that matches your budget and performance or tailgating needs. If you are you looking for high-quality Bose equipment that you can rely on for just about any gig or event, then the L1 Compact PA system is just right for you. One of the best things about this PA system is that it is small and compact enough to fit in a small car’s trunk or even at the back seat. It is the most portable Bose system designed to play for an audience of 100 people or more. It has an innovative modular design that makes it extremely easy and quick to set up. It doesn’t have a lot of gear or heavy speakers to haul wherever you want to go and perform. You don’t even need speaker cables with this system. It comes with an articulated line array of 6 speakers. The set includes an integrated 2-channel mixer complete with ToneMatch presets for each channel. The presets are for a handheld microphone and acoustic guitar. It features Bose Spatial Loudspeaker technology which ensures the sound is evenly delivered across the room or venue where you are playing in. It comes with a bass speaker already integrated in a power stand. Gives you two set up options for small and larger spaces. A great option for musical performances, classrooms, mobile DJs, business presentations and any other event that requires a reliable sound output. The L1 Compact System’s speakers have a unique vertical shape that ensures the sound is evenly distributed across the venue. The system’s bass cabinet, amplifier, and mixer are all built into a single unit. You don’t have to haul each part separately. A few users claim it is a delicate system that could break easily if mishandled but when handled with care the system can last and serve you for a long time. Doesn’t have as many functions as other high-end PA systems but provides great value for its price. 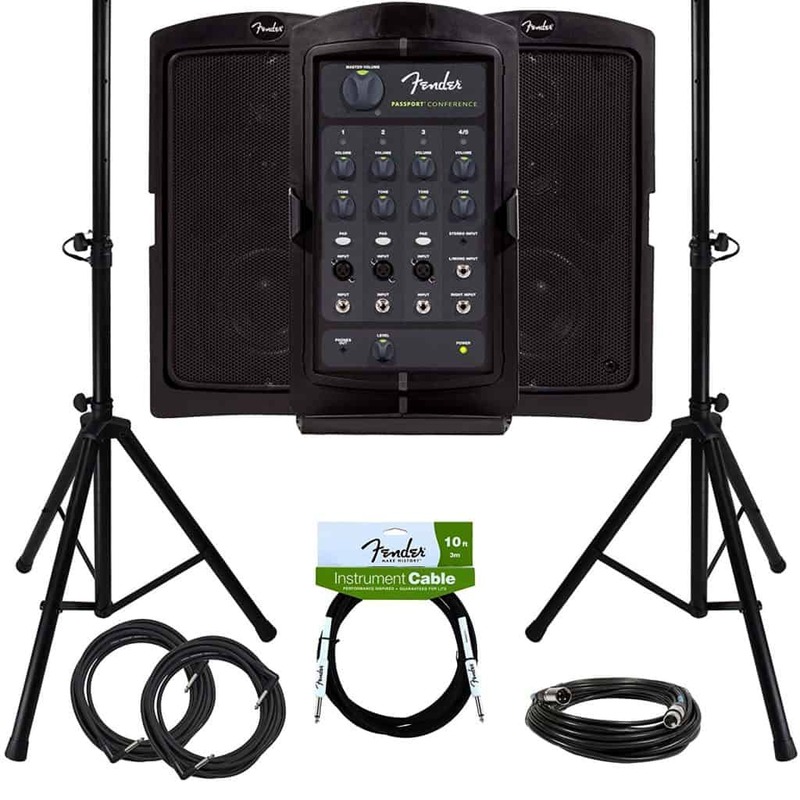 The Party 15 from PRORECK is a 9-piece PA system designed to enjoy your music and performance. It is a great option for any event that requires clear and reliable sound production including tailgating parties, social gatherings, anniversaries, speeches, backyard weddings, home studios, and for the mobile DJ who does gigs in different events. It has a powerful speaker system of easily portable 15-inch 200W PMPO 2-way speakers. It has Bluetooth connectivity as well as USB, SD Card Reader, Remote Control and FM Radio functions. It comes with a ¼ inch microphone as well as RCA Line output and input. It features controls for Mic, MP3, and Line. A power selector for 115V or 230V. 15-inch woofer, a built-in equalizer and a digital LCD display. It has built-in LED lights that give you a brilliant show of 4 colors. It comes with integrated speaker stands as well as two transport wheels for fast and easy mobility. The Party 15’s active speaker comes with a built-in amplifier to magnify your sound signals. It has a wide frequency response of 50 to 20 KHz which can amplify every type of audio input. The passive speaker is powered by the active speaker. It has an excellent 15-inch woofer and a high-efficiency tweeter to ensure that you get a full range of sound. The system’s speakers provide excellent performance for both indoor and outdoor events. The system has wireless Bluetooth connectivity, SD Card input, USB input, a Stereo Line input, Mic Input, and FM Radio to give you a versatile range of music or sound input options. Its remote control has several functions including volume adjustment, switch input modes, set equalizers, and play, pause or select songs instantly. You can do all this via the remote control from a distance of up to 16 feet. The Fender Passport Event Portable PA system provides everything you need to start performing instantly in a single package. It even comes with a stand and an instrument cable included. It comes with other extras such as an XLR cable and an Austin Bazaar polishing cloth to keep things neat and in perfect form. 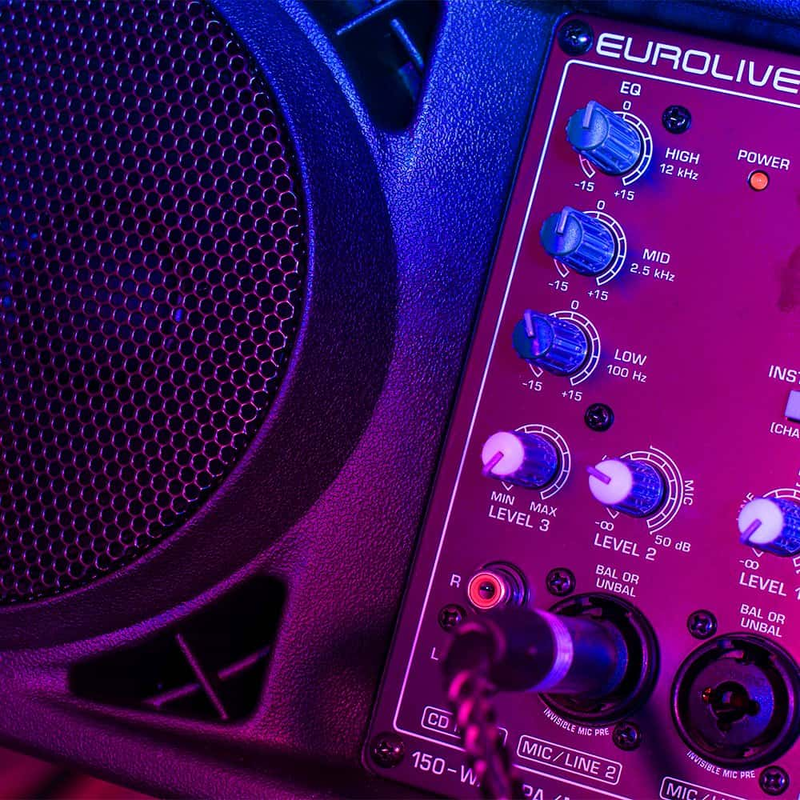 It has versatile controls and connectivity to ensure excellent performance wherever and whenever you are playing your music. The system’s speakers, intuitive front-panel controls, and powerful 375 watts of power provide reliable sound output for parties, sporting events, small clubs, business presentations, clubs, seminars, and educational events. It has convenient suitcase-style portability and is extremely easy to set up. You can even wireless audio from your mobile device to the system via its Bluetooth connectivity. It is a versatile unit with 8 input options, namely 4 XLR mic/line, Bluetooth, 1/8 inch stereo, ¼ inch stereo, and ¼ inch instrument/line. The Fender Passport Event is conveniently portable and easy to set up. You can carry it just like you carry a suitcase and simply flip open its cabinet to set it up. It is a great option for the mobile DJ or for playing music at gig parties and outdoor events. The speakers have a weird shape that makes it hard to stack or pack but the entire system is quite compact, eliminating the need to stack things on top of each other. The ION Tailgater is designed to make your outdoor and indoor fun events involving music special and truly memorable. 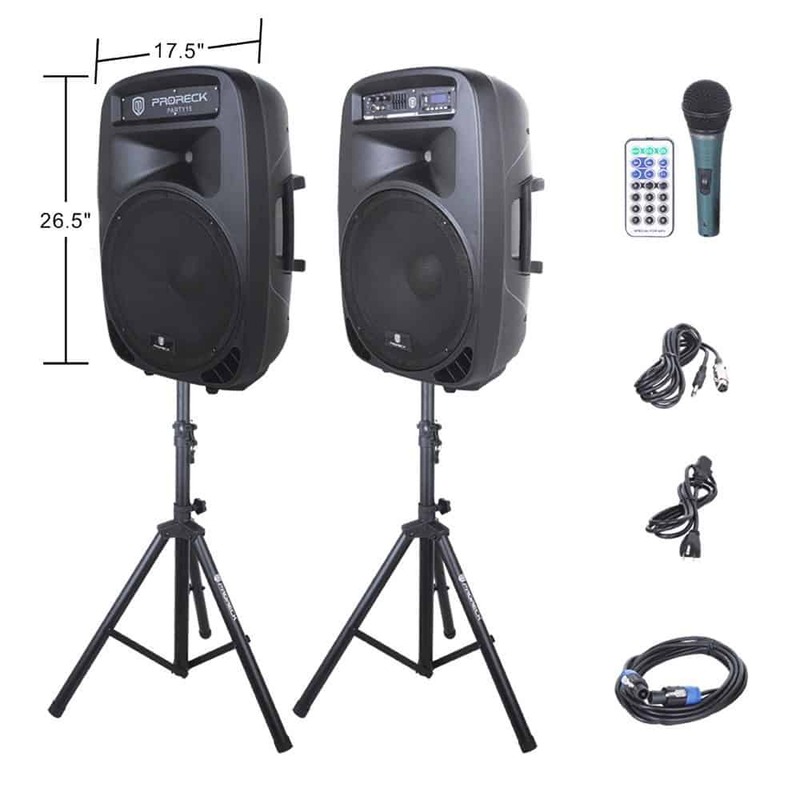 It has a 2-way speaker system and a powerful 50-watt dynamic amplifier that gives you crystal clear high-quality audio output for your events. The featured Bluetooth connectivity is for easy and convenient streaming of music from any Bluetooth enabled devices such as your smartphone or tablet. 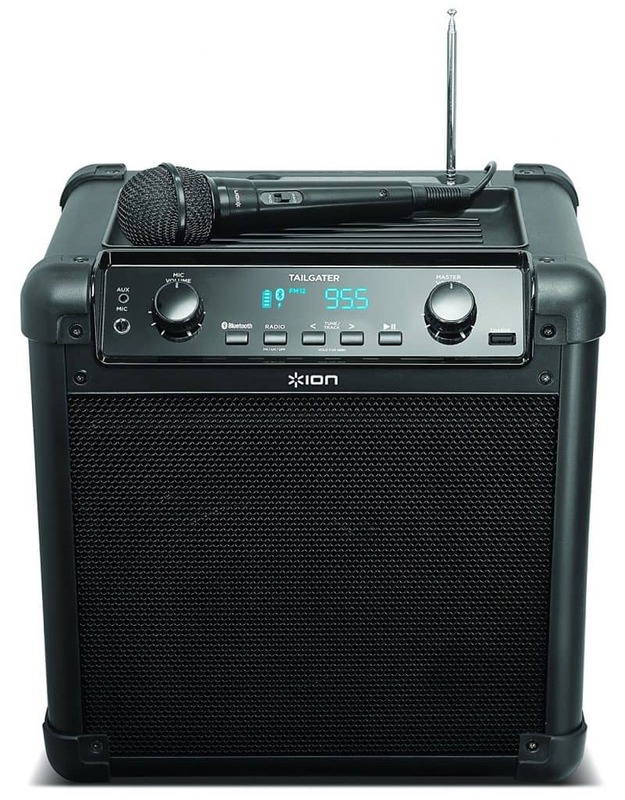 You can even play music straight from your favorite station via the AM/FM Radio connection or enhance the party mood with your own hype using the included microphone. The ION Tailgater allows you to enjoy your favorite music outdoors without wires. You can stream and play music from any Bluetooth enabled device from a distance of up to 100 feet away. It has a microphone included if you love karaoke performances or simply want to be the party’s announcer. It is a strong well-built set with reinforced corners for durability. It provides a wide range of input options too besides Bluetooth connectivity. You can easily plug in any music player to the system via the 1/8 inch aux input or simply connect the AM/FM Radio wirelessly. Its USB power bank port allows you to charge any mobile device or portable music player while having fun. Whether you are a DJ or music performer, achieving the best quality live sound can be a challenge without a solid speaker setup. The type of PA system you use will determine the quality level of your mixing. A good system provides great sounds without a lot of struggle with controls. The PA system products we have covered above provide exactly that, high-quality sound output without much struggle. Each of the products reviewed here is perfect for both indoor and outdoor parties and other events that require superior, crystal clear sound output. You can use them for your backyard parties, tailgating events, family gatherings, school events, pool parties, and even for business presentations. The products have varying price points depending on features and performance. Choose the one that perfectly suits your performance needs and budget.